Get ready to go on an adventure that will take you straight into the den of the lion where he keeps all of his gold and his loot. Get in there and grab what is yours from the Lion’s Share. All what you have to do in order to achieve this is place a bet and start spinning the reels of the Lion’s Share. Players will get a taste of what the game has to offer them in payouts through the paytable that they can see on the right side of the game. It is divided into 4 columns. The first one contains the different icons of the game and the other three columns show the different payouts for each symbol depending the betting level of players, whether they placed 1 coin, 2 coins or 3 coins. 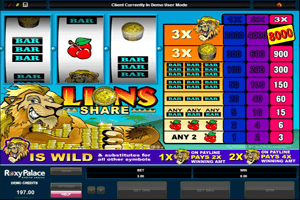 Play Lions Share Tiger Slot here. The highest paying icon is the Lion symbol which acts as a wild multiplier that will substitute for other icons and multiply the wins by 2x or 4x if 1 or 2 lion symbols land on the payline of the game. It also gives the highest payout that can amount up to 8000 coins if 3 lions fall on the payline of the game. Other icons include golden coins and the usual bar symbols that can be found at almost every classic 3-reeled slot machine.